It is getting easier to turn the physical world into data. But what can you do with that data? Technology to capture three-dimensional visual information is finding its way into more industries—even tailor shops. The folks at Arden Reed in New York, for example, are making precisely fitting dress suits, thanks to 3D body scanners. This is just one way the real world is stepping into a digital fitting room. Arden Reed is not the first to use 3D scanning for fashion, but it shows how the technology is maturing and spreading. For the apparel world, the startup offers an update to the traditional tape measure used to figure out customer sizes. “The process really hasn’t evolved in the last 100 years,” says Carlos Solorio, a co-founder of Arden Reed. To make that process simpler for customers, Arden Reed puts its scanner-equipped fitting room on the road in the back of a box truck. Primarily available in New York City, Arden Reed’s truck wends its way along avenues and byways, and then parks to let clientele step inside. Folks strip down to their skivvies so the scanner can read their dimensions. The truck makes scheduled stops for groups, including co-workers from the same office who may want new suits. “We’ve traveled to Philadelphia, Washington, DC, and Boston,” Solorio says. The data can be used for more than just measurements, he adds. Arden Reed is working on a way to do completely virtual first fittings of its apparel. 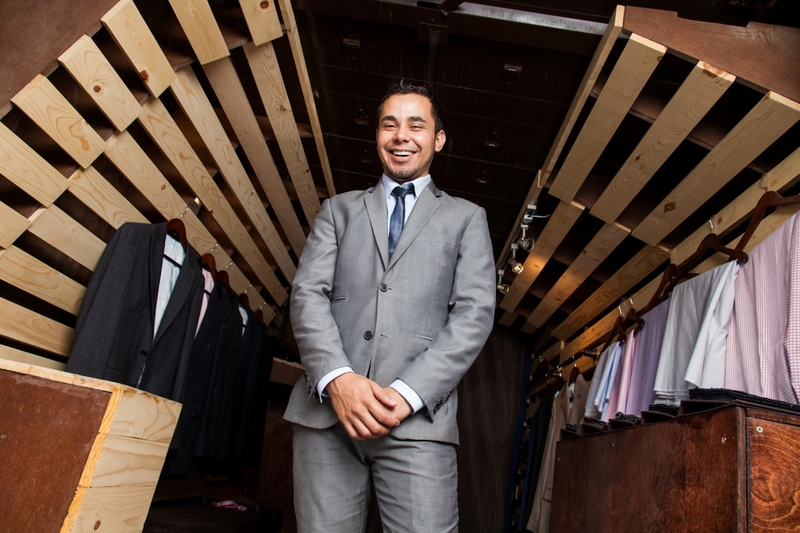 Traditionally it takes three or four fittings, Solorio says, to get a custom suit just right. With 3D data, a digital version of the suit pattern could be compared with a model of the customer before the first stitch is even made. Inside the truck, the scanner takes measurements. Customers usually get their suits four to six weeks after stepping inside the Arden Reed truck, Solorio says. The company works with outside tailors, he says, but also does a lot of production in-house. Solorio says his co-founder, Mike Abadi, had been selling suits since his college days. Prior to Arden Reed, Solorio was an analyst with Lehman Brothers and then Barclays Capital, where he worked with Abadi. The duo created the Arden Reed brand in 2011 as an online seller of custom suits. Faced with a lot of friction from the apparel industry and growing competition, Solorio says, they looked for ways to differentiate the business. Arden Reed sought to make it easier for customers to order suits online without having to measure themselves. Having seen some early uses of 3D printing, Abadi wanted to adapt the related scanning technology to fashion, Solorio says. Others have also sought to exploit the capabilities of 3D scanners for apparel fittings. In academia, a Cornell University team has been researching how the technology can be used in clothing design. Acustom Apparel, another New York startup, uses 3D scans to create custom menswear such as suits, outerwear, and jeans. Likewise, Britain’s Tailored For You uses scanners to take measurements for bespoke apparel. Interesting to read about 3D scanning for custom clothing. Thanks for sharing. the suits are not BESPOKE, they are made to measure (a big difference in the quality of the making of the suit).